MARYAM BAZZA'S FINGERS, gripping the stub of a half-finished pencil, slowly applied the eyeliner to her brows. She looked in the mirror on the table where she sat—perfect, she thought. She put the pencil back in her little pink leather purse, a gift from Faruk, and took out the beige lipstick which she then proceeded to apply. The room reflected in the mirror was neat with a blue duvet on the bed, touching the floor, carpeted brown. A door led to the bathroom, and another set of doors held the wardrobe. One of these was slightly ajar, so that rows of metal hangers bereft of clothes were caught in the span of the mirror on the table.Satisfied, Maryam Bazza looked at herself in the mirror. She had grown lean in the last two years, shedding the last of her adolescent plumpness so the face that stared back was ovoid, accentuating her elegant brows and her full lip. She winked at herself and in one movement leaned back so the chair pushed backwards noisily. She got out of it, taking care to pick up the leather purse. She smiled at her reflection and said her name under her breath. She was ready. She pressed the lid of her blue travelling trunk shut, pulled out the carrier and rolled the trunk to the door. When out, she shut the door with a sense of finality. She struggled with the trunk down the stairs and left it to find her step-mother in the kitchen. The woman, Saadatu, just a decade older than she, looked her over then smiled. “It’s today,” she said meaninglessly. Then she gathered Maryam Bazza into a full hug. The women hugged once more. Maryam found her father outside, overseeing the washing of his car, as he did every day. Idi sat with him and they were sharing an early morning cup of coffee for Idi’s benefit. But she did not answer. She merely looked down at her feet. “Yes, Baba,” she finally said. She did not look at him until after she had entered Idi’s car, a green Peugeot 406 wagon, when they were reversing out of the gate—then she looked up at her father with tears in her eyes. He waved and smiled bravely. The herdsmen had already passed, there were no cattle and no egrets to bid Maryam Bazza goodbye—all there were were Bolewa’s trees, dotting the harmattan-ravaged savannah like mistakes. But they too were witnesses, had been there at the very beginning when a young princess had fallen in love with one man, and then with another. Maryam sat in front of the car and watched the silent trees pass her by, and she wondered about Faruk and his mother, and about his wife and his mother-in-law, who was serving a life sentence in Yola. She thought of all the women she was and the dreams she would pursue at the University of Maiduguri, and the rest of her life to come past her day by day like these trees. She did not see herself as the trees of Bolewa saw her, as a spot of calm moving on, a closure borne safely by the wheels of the Peugeot which turned up little geysers of dust as they spun sedately out of town to the highway. She did not see the playful breeze that suddenly started to make the trees wave their hardy branches, enwrapped as she was with being in her time. But she did wonder when the rain would be here. 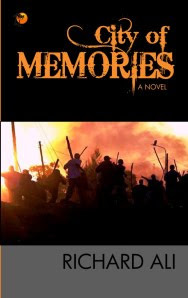 City of Memories is published by Black Palms Publishers and is available in bookshops around Nigeria.